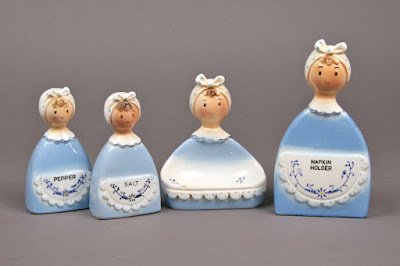 These vintage Davar kitchen maids kitchen accessories date from 1966. The darling set includes a scouring pad holder, a napkin holder, and a salt & pepper set. I love their little housecleaner scarves! If you just wanted the salt and pepper set, there's one over on eBay. These would be so cute in a retro powder blue themed kitchen!